It's Dangerous To Go Alone! Take This Detailed Custom PC. Here's something Link never found inside a treasure chest: a microATX motherboard. I don't really know what he'd do with one, to be honest. Surely something in Hyrule is susceptible to silicon and electricity? It's probably less useful to him than a sword and horse are, let's be honest. But here in our world, wandering around with swords gets you into trouble but computers! Now those are everyday necessities. 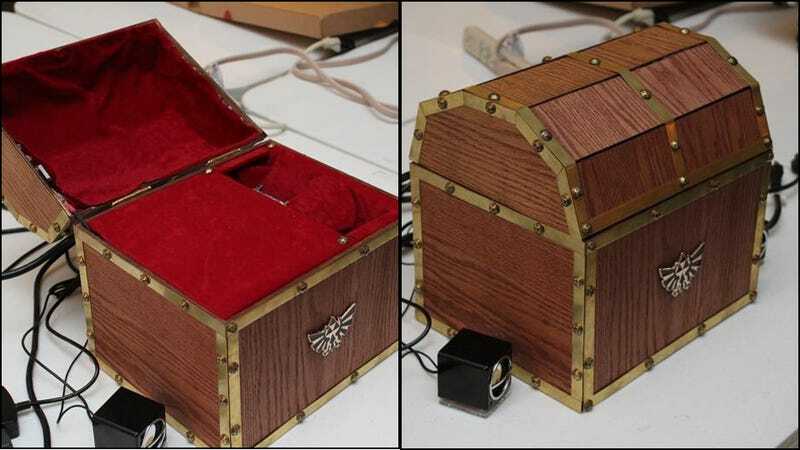 And so what's inside this Zelda-inspired chest is a custom PC by Reddit user Slash_Fury. In the comments, he adds, "I also crammed an Arduino in there, which would listen to a switch to see when the case was opened, allowing it to play the "item get" sound and light up the yellow LEDs pictured in the album." Because what good is acquired treasure without a sound? No good! The full album has a bunch of different angles on the impressive case, as well as some shots of the build in-progress. Scroll down for a couple highlights or hit up the album for the full set.